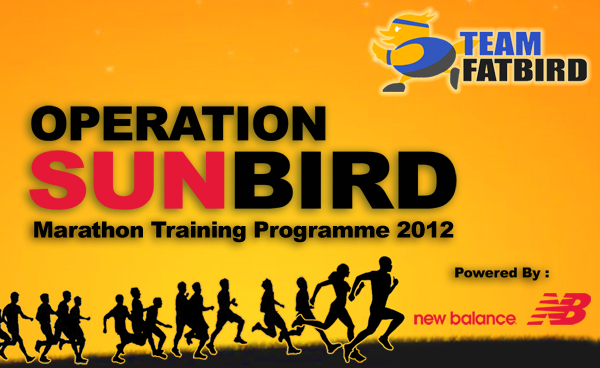 Operation Sunbird 2012 roared off to a good start with more than 130 participants attending this first session at ECP. 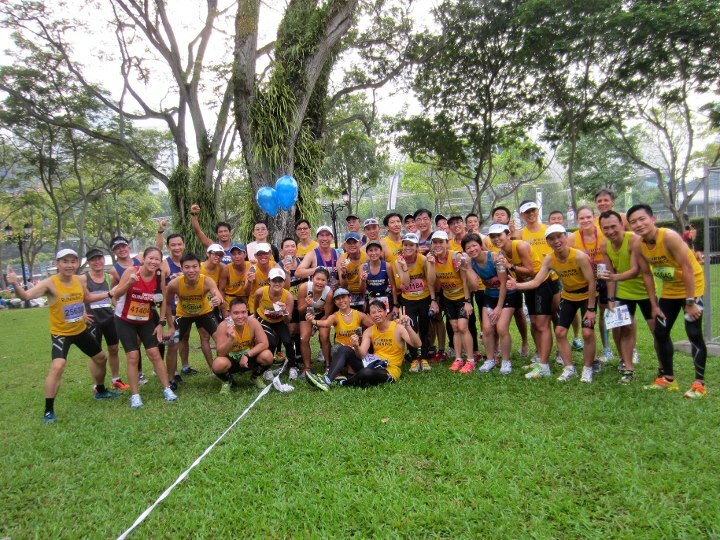 Although the turnout was about 80% because of a number of races the following day, it was still an happening kick off for this 12-week marathon training journey with Team FatBird which will see our flock base-building and picking up the paces across hills, trails, slopes, roads and park connectors. 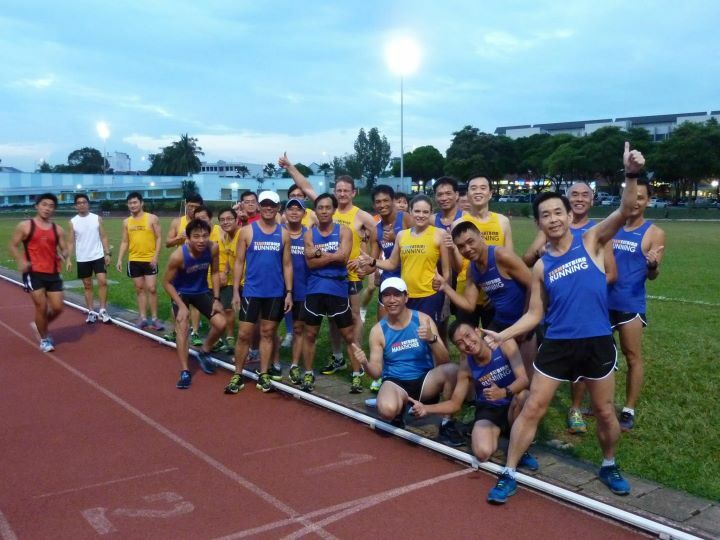 We had a nice mix of trainees from various FatBird training operations, and also new runners who have joined us for their maiden structured marathon training, all having hopes of bettering their own performances and achieving set targets at the Standard Chartered Marathon Singapore (SCMS) on Dec 4. 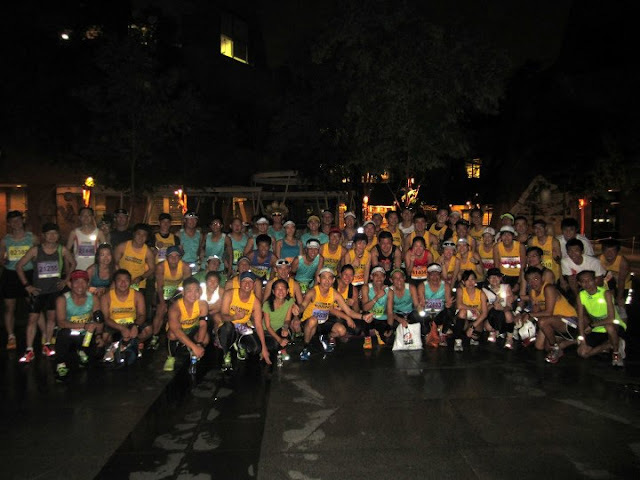 By the time we began with the welcome and ops briefing, most of the participants have already done their sizing for training and finisher apparel, plus settling outstanding admin matters. From the looks on their faces, this cohort of Sunbirds have come well prepared, even the relatively new birds, for they have done quite a fair bit of homework and preparations – certainly a good step in the right direction. 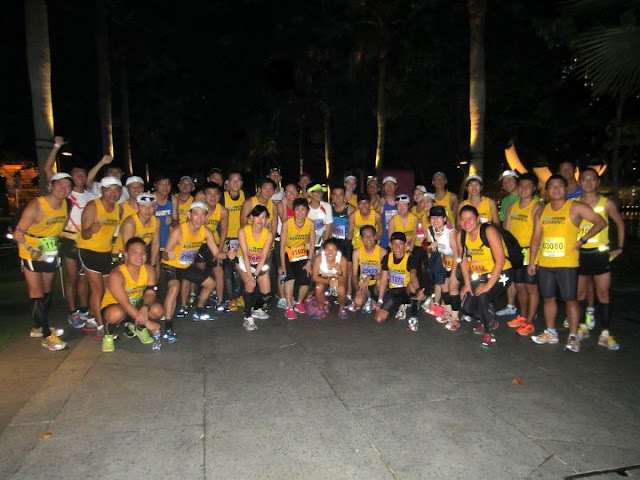 As with all FatBird operations, the participants were teamed into respective groupings of similar capabilities in order that all can train and improve together within groups led by experienced marathoners and pacers. After the morning’s objectives were dished out, along with the customary group photo, we set off in the direction of the NSRCC at our target base-build pace and effort. 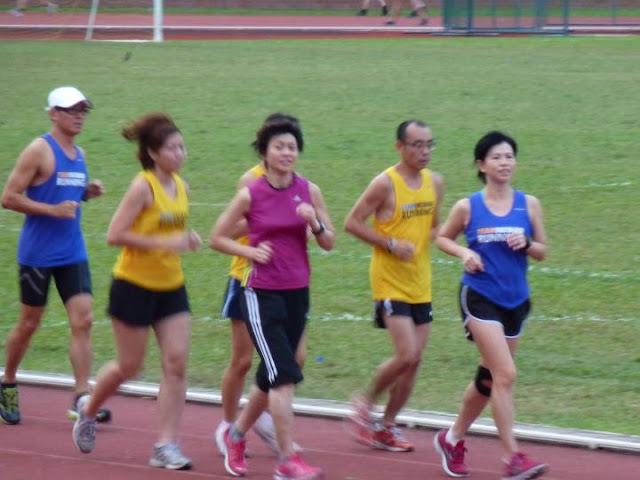 There was a hive of activity along ECP as the Olive Run was also started at around the same time, just that they were running in the opposite direction to our flock – traffic was quite smooth nonetheless, and we were able to maintain that ‘chit-chat’ effort mostly along the prescribed 13km and 21km distances. For many of the past participants, especially those coming straight off from Ops Kingfisher and AHM, this run was more of a recovery and settling into a marathon rhythm – quite manageable and almost relaxing as we ran in groups getting to know one another. 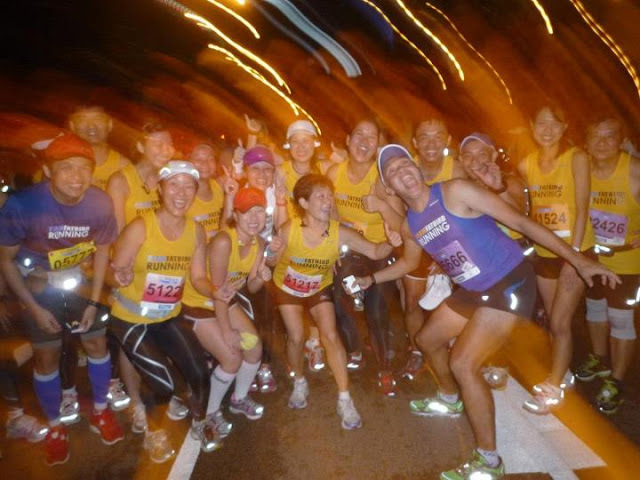 Most of the participants finished within the maximum time allocated, and because of the different return timings, we conducted 2 separate post-run debriefs. The Sunbird trainees were all excited and wanting to learn more, especially after what some termed to be ‘a rather challenging’ experience for the newer birds. This successfully executed first session should set the tone for progressive buildup of the foundation of these Sunbirds, and as they progress with distance and pace over the course of the next couple of weeks, we will see the participants settling into their training groupings, all ready to tackle pace training in the second half of Ops Sunbird. The Sunbird Trainers were happy with what we saw in this Sunbird cohort, and we look forward to meeting up with the rest who did not manage to be at this morning’s session. The Sunbirds Have Started The Wheels Of Motion – for what should be a memorable voyage of endurance development and marathon performance enhancement. 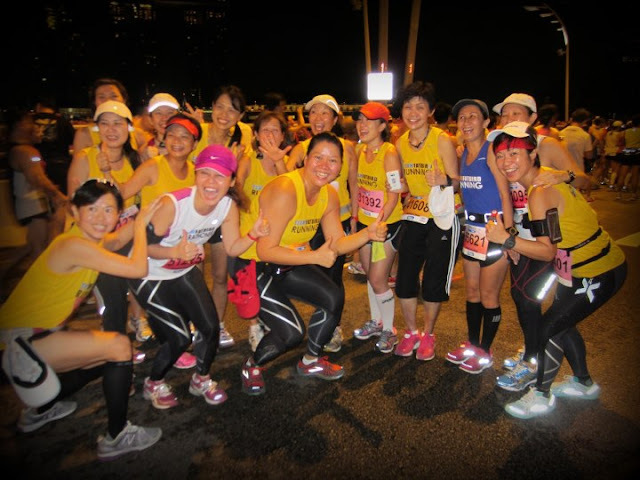 Operation Sunbird 2012 – Follow Our Pace, Win Your Race! Information and Registration for Ops Sunbird HERE! OPS SUNBIRD 2012: REGISTRATIONS FULL! 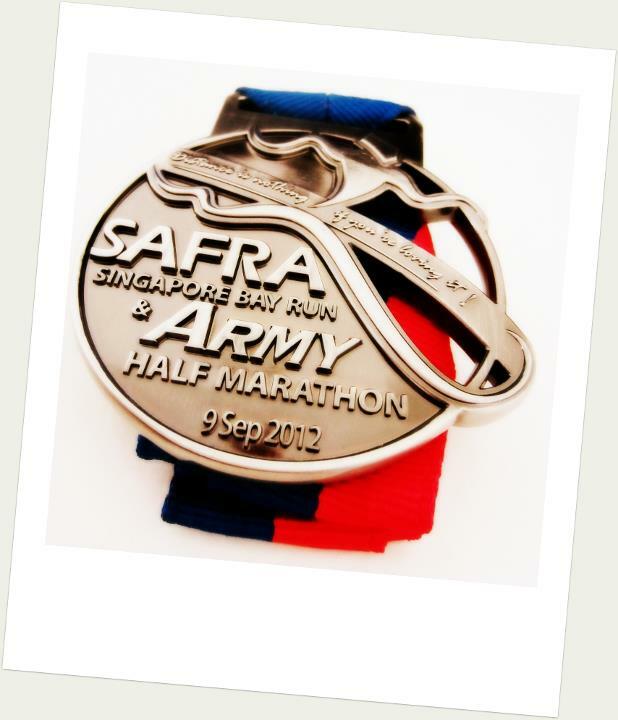 Training Starts 15 September 2012! CLICK TO REGISTER BASIC PACKAGE! 1. 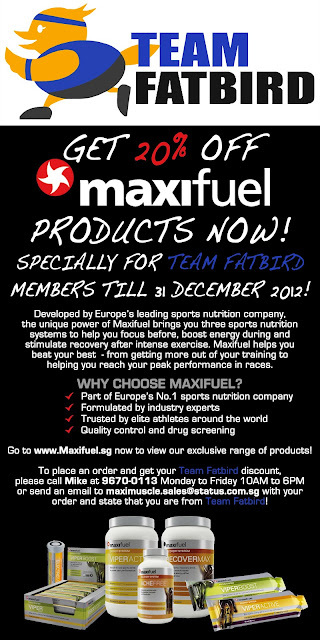 12-week Team FatBird (www.teamfatbird.com) Flight-Zones™ Marathon Training Program. ..........• Heart-Rate & Pace Training sessions. ..........• Isotonic Drinks/Refreshments after long runs. 2. A NB “OPERATION SUNBIRD” TRAINING tee. 3. A pair of NB shorts. 4. A NB “OPERATION SUNBIRD” RACE DAY singlet to trainees who meet attendance criteria (50% sessions). 5. A one-time 50% kit-up discount of New Balance apparel, shoes, products. ++ As NBRR 2011 is incorporated as part of this training program, you will be offered highly discounted registration fees if registering through the Sunbird Program. We will be registering NBRR 2012 for all Sunbirds as a group under the corporate discount program. 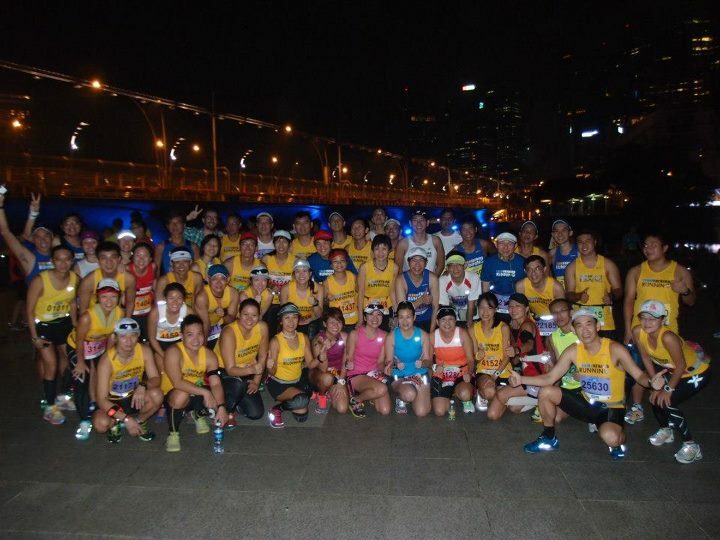 You will be asked for registration information and payment closer to the date of NBRR race. Training will begin in September 2012 for successful applicants. Check HERE for Program Information and FAQs! REGISTER FOR BASIC PACKAGE HERE! 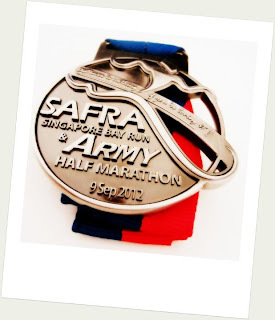 The annual Singapore Bay Run / Army Half Marathon (AHM) has been recognized as the largest and most important half marathon race in the Singapore Running Calendar. When it was rumored to be called off, there was much disappointment in the running community…good that it was eventually announced to be ‘ON’, albeit 2 weeks later on Sep 9. 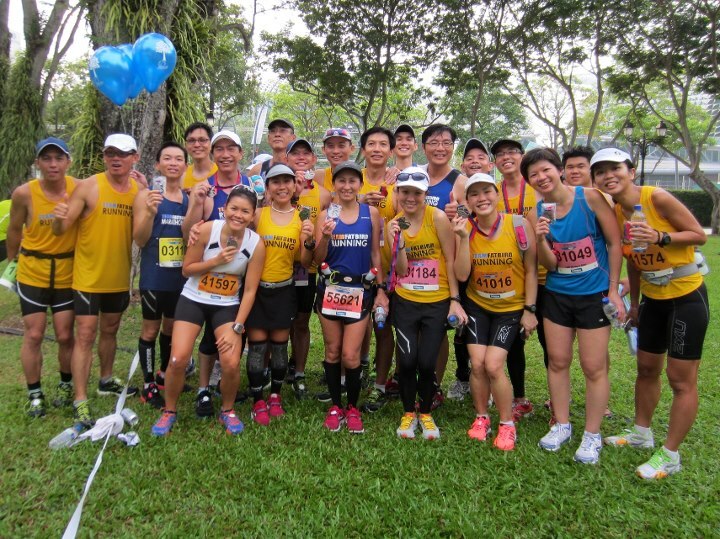 Team FatBird’s Operation Kingfisher was primarily started to train a group of 100 FatBird Runners for this event. 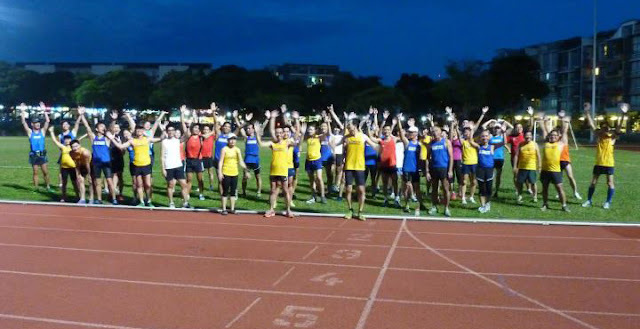 Comprising of hill-work, intervals, speed training and long tempo runs, the 6-week 10-session structured HM training program prepared the participants well for their final test today – The Army Half Marathon. Decked out in bright yellow Kingfisher running jerseys, we gathered just outside the Esplanade area a full hour before race start to warm-up, take group photos and go for the final loo-visits before lining up near to the respective Newton pace groups. 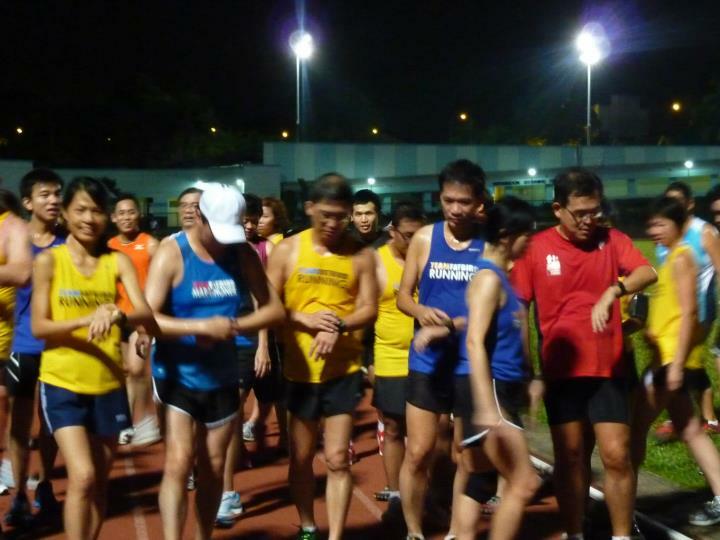 This year’s AHM saw a lot less participants from the Army units as they were all encouraged to do the 10km distance instead. After some light entertainment from the MC to keep the crowd motivated, we were flagged off promptly at 5:15am. There was a light congestion at the beginning as some of us did not manage to get to the front in spite of us being there quite early. Still, we were patient as we paced ourselves and move to within sight of the pacers, and then putting our race plan into execution. The cool air after an earlier bout of showers made the early kilometers pleasant, although the humidity levels remained high. This year’s AHM route was generally an improvement over 2011, save for a few choke points, especially bad near the Tanjong Rhu area. The tour around the Gardens by the Bay and avoiding the pancake-flat ECP were welcome touches to the course, although the pre-dawn start would not allow much scenery to be visually enjoyed. Still, the nice weather and generous support stations of isotonic drinks, bananas, Salonpas gave us a peace-of-mind to focus on the race at hand. In a bid to make the ground conditions even ‘sweeter’, the race organizer actually laid red carpets along certain stretches. 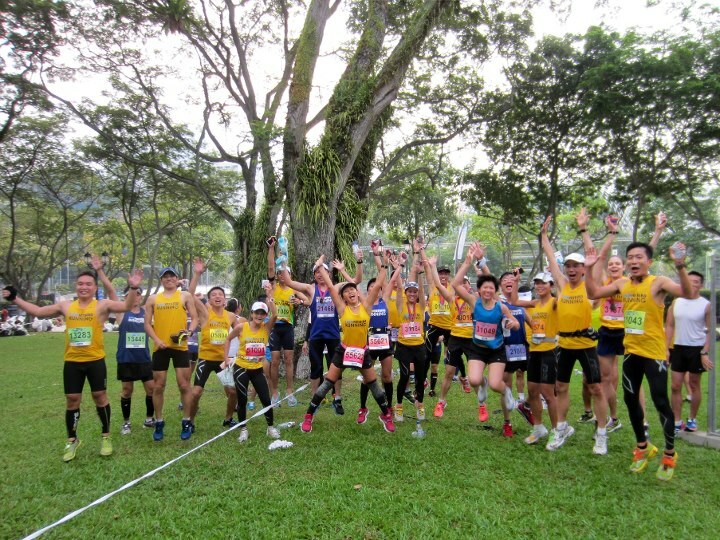 However, as they were laid directly over uneven grass patches, the carpets posed some potential danger for falls and trips to the runners – in fact quite a number actually tripped up and got twisted ankles and swollen knees from falls. 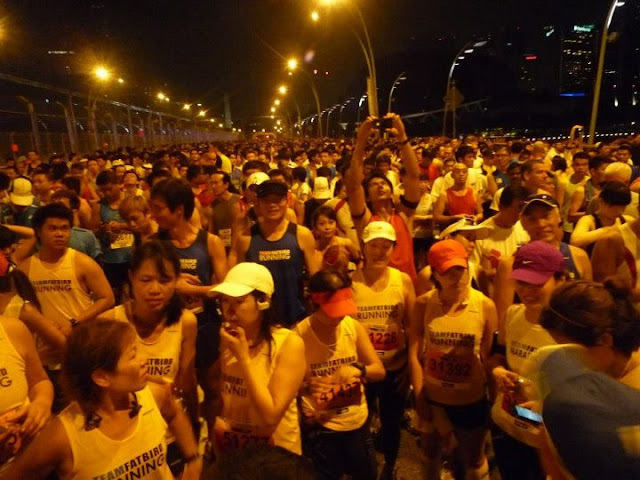 The bottlenecks were a problem mainly to those running more than 2h for the 21km as they had to wait anywhere from 2-5min for certain choke-points to clear. 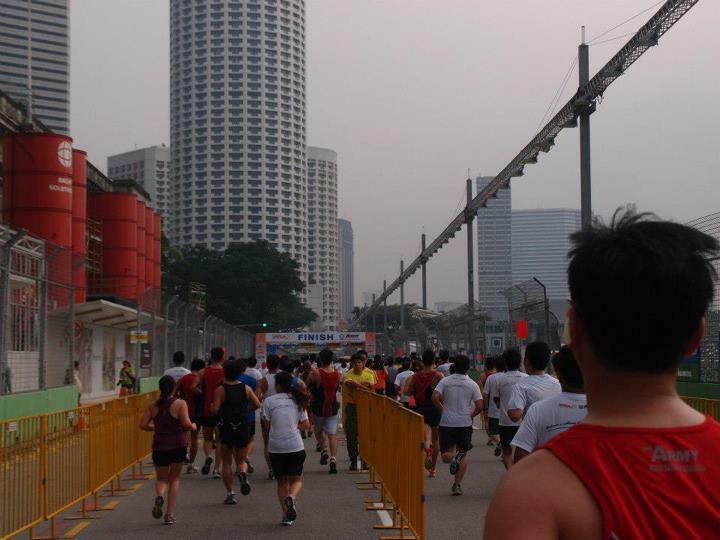 itself even till 9am, making the final km of the run more sustainable. Although there were the occasional cramps from pushing the pace, most of our runners were able to sustain their planned paces to finish strongly inside of target times. Heartiest congratulations go out to all of them who trained and raced to expectations. 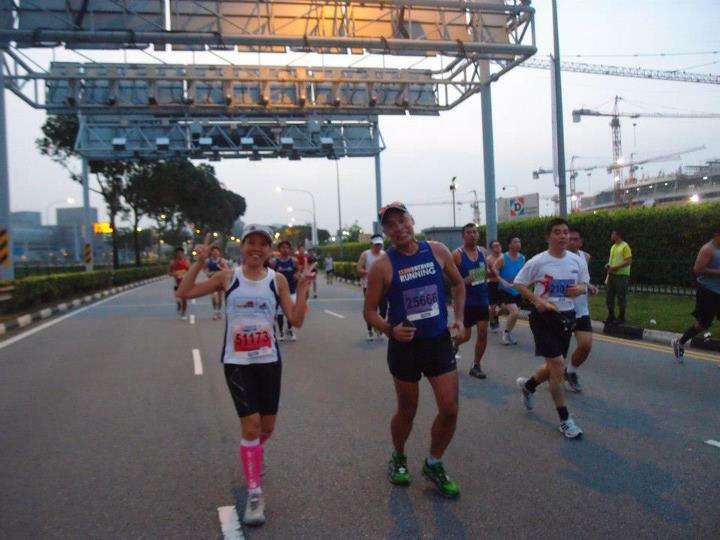 Even the few who had caught the ‘flu’ bug just before this race ventured down and completed in very respectable form and time. We are pleased to hear that most of the Kingfishers achieved their targets, with many doing outstanding timings and Personal Bests. That is testament to the effectiveness of the short training stint we shared as a team. 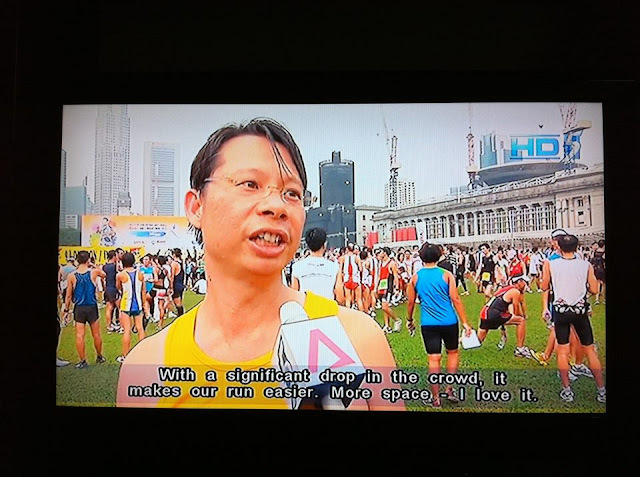 Video Capture by Francis K.
As we gathered near the Tan Kim Seng fountain to exchange congratulatory messages, share the joys and satisfaction of our race, take many group photos with different poses, we were glad we put in the commitment and dedication to training and following our race and pace plan to reap the fruits. Kudos Kingfishers! 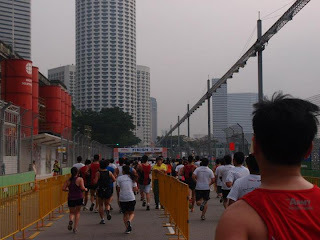 As we joyfully headed to nearby Marina Square to refuel and recharge, we were not feeling that drained nor too tired, with some even able to do multiple jumps and possibly planning for a recovery run later in the day. As we rest our tired but ‘happy’ bodies, we are already thinking of the next training stint…yes, Operation Sunbird will commence in a few days time. 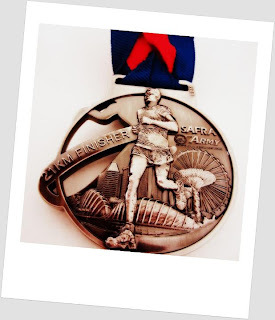 Running The Bay? FatBirds Have Shown The Way! With a week to race day (AHM), we wrapped up the Kingfisher Program with a final session to the track for what would turn out to be a delightful evening of track menu of 800m sets cooked with reduced minutes and floats, thoroughly enjoyed by all who came. Since we had only 90min to complete our act, we got down to serious business with the FatBird Mile Trial done in their respective groups. 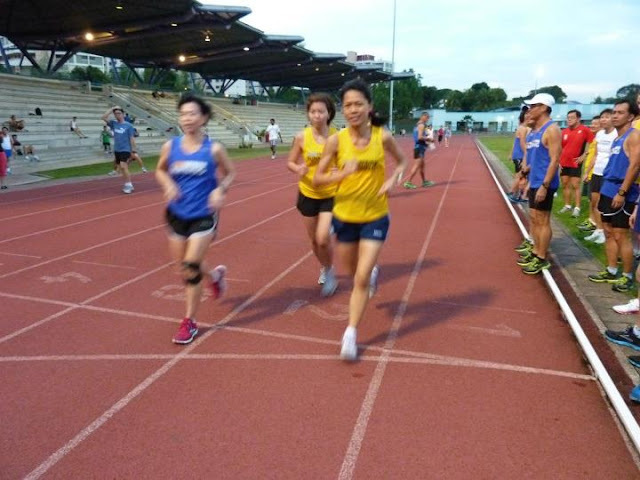 It was evident that the Kingfishers had improved from when they first started with the program, what with them doing the mile at a pace that left room for the execution of the main course (making sure they had reserves plenty for tackling that ;D). The first segment of the main course was consumed with gusto, moderating to a more managed target pace by the second set. With the reduced rest time interval, it seemed that we had barely recovered from ‘gasping for air’ before being called upon for the next set again. 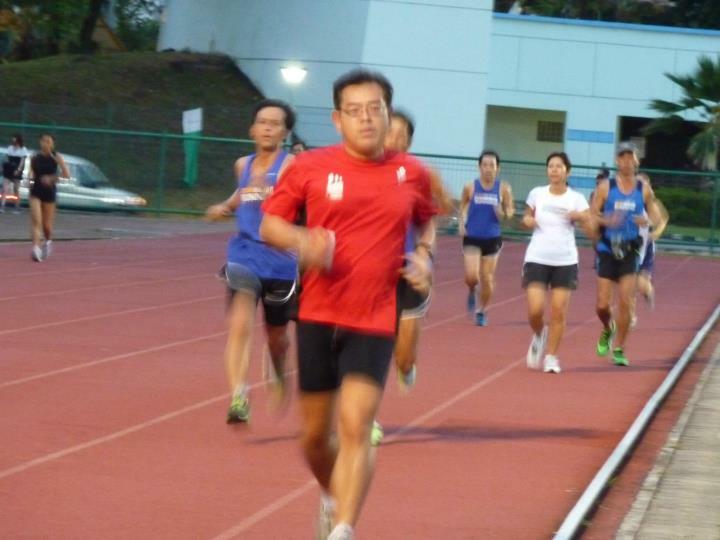 However, with the base and foundation built up over the past few weeks of intensive training, the Kingfishers were able to sustain without dropping off the pace nor feeling too much lactate buildup in the legs. The final segment had us going for sets without any rest intervals, but instead ‘float’ allowances were provided for partial recovery – this to test our endurance for a sustained hard pace over multiple sets. This provided the ultimate stimulus and challenge for the night, and as we counted down to the sets and floats, we were pleasantly surprised to see ourselves able to maintain the pace and not ‘dying’ even after we had completed that finale segment. So, it was all of 10 sets, 8 of which were at SpeedyBird pace, definitely no mean feat for a flock who started with barely being able to do only 4 sets at sustained effort. 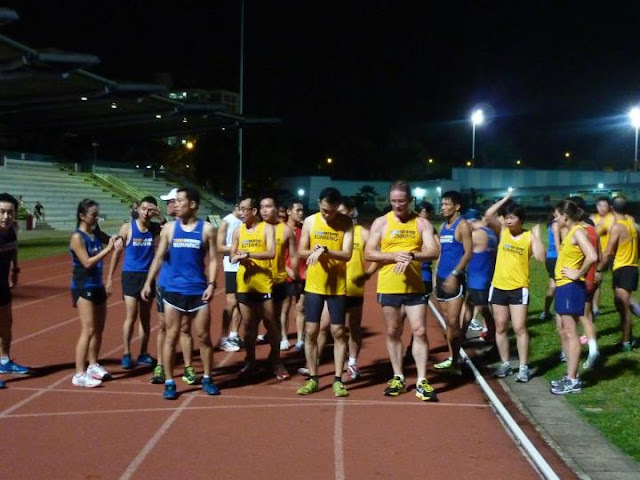 As we cooled down and chatted about the night’s workout, many Kingfishers found themselves to have recovered very quickly from the just concluded speed workout. As we shared some moments reflecting the 6-week Kingfisher journey, many were happy that they had improved so much on their strength, speed and endurance since joining the program. The Kingfishers are now raring to ‘fly’ the bay this Sep 9, and we wish them all the best and godspeed. Running The Bay? FatBirds & Kingfishers Will Lead The Way!